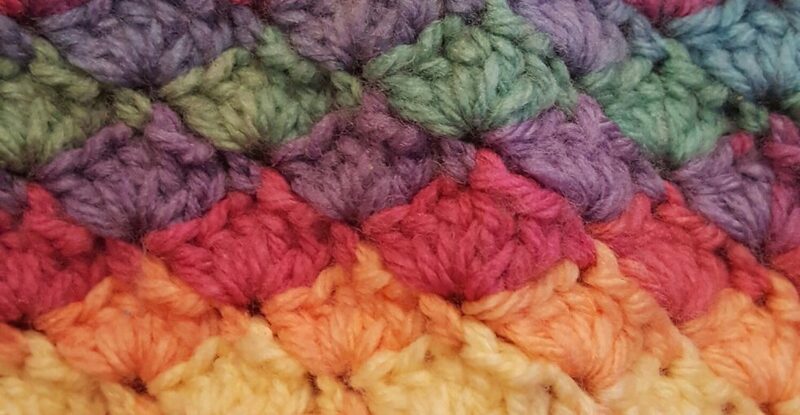 This is something I’ve been working on for a couple of weeks now, and I have tested the pattern using both super chunky chenille yarn and aran weight yarn. I decided to call it the ‘create your own’ basket as I have given various options for sizes and patterns for the sides so it is a truly customisable project. It means you can make a unique set of nesting baskets really easily, and there are enough options to make them all different if you wish. The patterns for the sides include two sizes of basketweave and a ribbed effect, and I have included three base sizes. Because it is intended to be used with any type of yarn, i haven’t included exact dimensions as there are so many variables. Hopefully, by adjusting yarn type and hook size, you will be able to achieve your desired size. When made with super chunky chenille yarn, the largest size can accommodate several 100g balls of yarn. I’ve saved it as a PDF so that you can download and print it easily; if you have any problems following it please leave a comment and I’ll do my best to help. I hope this pattern is useful to you, if you use it please tag me so I can see your makes, I’m @craftandothercrazyplans on Instagram or you can link back to me through your blog. Thank you for sharing such a nice pattern. I love it! Good to know, I would not have thought to ask! You’re welcome, good excuse for yarn shopping! I might give these a try. I need a couple of baskets for my livingroom to keep my current projects neat and tidy when I’m not working on it. Thanks for sharing the Pattern! I am beyond excited to give this a try! I may have to use some of my leftover stash and see what kind of colorful baskets I can come up with! If I do make them I will definitely let you know and see if I can get a picture for you. Thank you for sharing your pattern. I will put it aside to make when I have finished other WIPs. Thanks for the pattern, they are so cute!